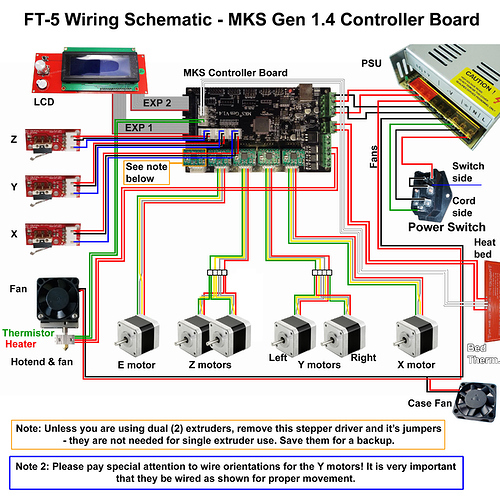 This is strictly for stock parts wiring - absolutely NO add-ons are included in this, sorry. 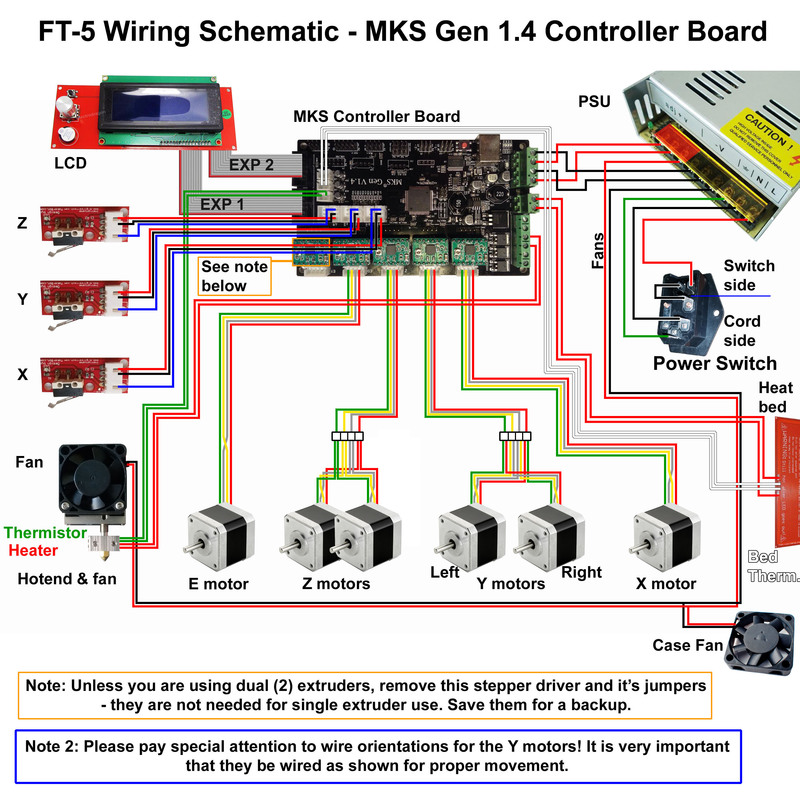 Member @Ron created a version of this schematic that adds the part cooling fan wiring and bed heater booster. You can find the post here. There ya go. All pretty now. I was looking at the wiring of the power switch/fuse block and unless I'm just confused by the terminals, it looks like you are switching the neutral line. That would leave L1 (the hot leg) energized, which is a very unsafe thing. Again, I could be reading this wrong, my 61 year old eyes are not what they once were and if so PLEASE accept my humble apologies. As others have said, this is an outstanding graphic aid that will be very helpful. You are indeed correct sir. The hot leg should always be switched when only one leg is broken. @heartless this should be fixed as it could cause an unsafe situation if someone touched the wrong thing even with the switch off. Great catch! Thanks for speaking up! @heartless what did you use to draw up the FT-5 wiring? I have another project where I need the same detail. I was reading through the v6 manual and the wiring instructions were very confusing.... Until I got to this diagram. A lifesaver. Thanks. so the red & black wires need to be swapped at the switch, correct? OK, I think I have everything addressed that needs to be addressed - if not, please let me know! 10/8/16 - I am going to ask that anyone that wants to share this image in another forum, or group, PLEASE, ask permission first. A little common decency is greatly appreciated. Chances are I will say yes, go ahead, but I would appreciate being asked first before anyone does so. Updated original post with new image. I use Photoshop for this kind of thing. each item was on it's own layer to make editing easier. Your wiring to the Z motors doesn't jive with the instructions on page 59. The instructions have the builder reversing the yellow and gray wires at the connector. You show them straight through without reversal. The Z motors have no wires crossed as they both rotate the same direction. Topic pinned. Thanks @heartless for your contribution to our community! A lot of people ask about where to wire up the print cooling fan. Might want to make note of it at least where to connect it at. I'd also love to see a more advanced version including the BL-Touch. This is true but I do not understand why. The connection is clearly marked "FAN".